They started on Wednesday morning. There are about a hundred men involved. Most came in buggies but a few got rides. Since they don’t want their pictures taken, we waited until they broke for lunch to take a picture of the barn. Barn-raisings don’t happen quite as often as you’d think in the larger, more established communities, like Lancaster County. This is because you don’t have tons of folks setting up dairy farms from scratch anymore (expensive land). You probably have at least as good a chance of seeing one, pound-for-pound, in off-the-beaten path settlements like this one. 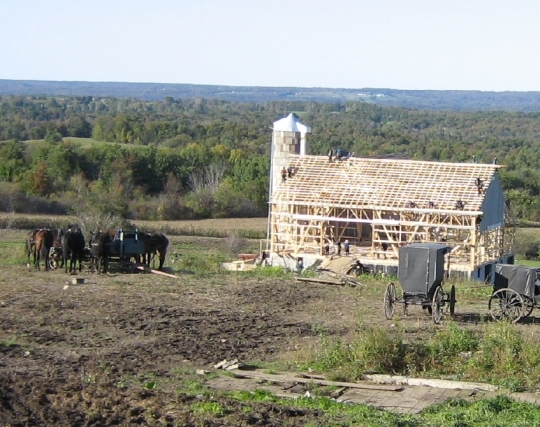 Read more on the Amish barn-raising. 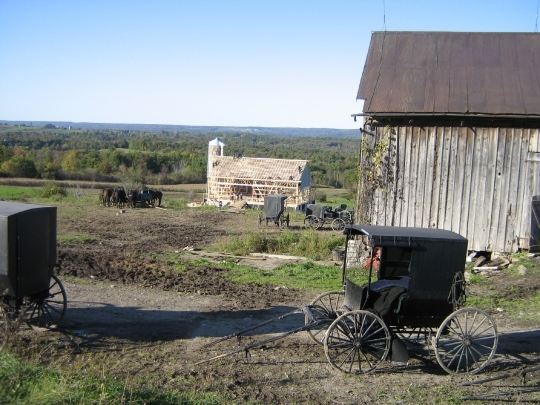 Amish in New York also apply their skills with wood to other areas, including construction work and furniture making. Read more on New York Amish furniture. Thanks for sharing; those are beautiful pictures. Hey, here’s some insider info. I was told by my former-Amish son-in-law that you (English) CAN take pictures; just do it and don’t ask. He told me that they were taught if an Englisher asks to take your picture you must say, “no.” However, his sect would not stop anyone from taking their picture. Interesting, eh? I think the Amish might not stop someone from taking their picture to avoid conflict and/or drawing attention to themselves. We English CAN do a lot of things, but it doesn’t make it right. “Just do it, and don’t ask”….no wonder the Amish prefer to stay separate. Frankly, I’m glad no one wants to take a picture of me living out my daily life. I enjoyed the pictures of the barn going up. The Old Order Mennonite are also concerned about people taking pictures. When they had a house raising and barn raising for a new couple, I wanted to take pictures and asked permission to take pictures. They kindly told me no. When I explained I would take one of the area before they started, a second while they ate and a third after they were done,they still kindly refused. Of course they didn’t know me then like they do and told me they would allow me to take pictures if I didn’t take them of people the next time they put a barn or house up. I explained my camera and told them that after I took the pictures, if they wanted to see them they could and I would delete any pictures they didn’t approve. They agreed so I am waiting until they build another barn or house again-probably in the spring or summer. Marilyn, how interesting! I look forward to seeing those photos next year (I hope)! That was a very thoughtful thing to do, offering to delete those pics that they didn’t approve of! I’ve always wanted to go to a Barn raising. My cousin lives among the Amish and goes to those all the time. He’s said he is always invited over for the house raising/barn raising and the weddings. If I ever get to Iowa again, maybe I will be allowed to join in. There were some English men helping at this barn raising; I saw at least the drivers working on this barn. I heard that some local English helped at the last one, too. I don’t know all of the details about photos yet. If you ask, people will tell you that they do not want their photos taken. But they enjoyed looking at an envelope of photos we had with us that we had taken of other things. The kids were happy because they all had a 1/2 day off from school that day. Roberta, thank you for the photos and the background info on them. Interesting about the English drivers helping out,too. I wouldn’t think the Swartzentrubers would want to mix with the English, but it seems otherwise, at least in this case. If the pictures were taken during the lunch break, did they end up finishing the barn in one day? Were these the Swartzentruber Amish? I noticed there were no orange triangles, and the buggies seemed quite plain. Good observation Lattice. I didn’t catch that. My guess is yes, these are Swartzentruber because they prohibit the SMV triangle on their buggies, windshields, and any “adornment” such as lights. This is a small group which I don’t know too much about, but I’d agree with Brenda here too about them probably being a Swartzentruber group. There are not too many other Amish that don’t use the SMV triangle. Barn Raising is a Religious Experience? My next door neighbor told me the most religious experience he ever witnessed was an Amish Barn raising. At the one he watched, the men were singing together in unison. The women as described above, working & serving, along with the children. Everyone had an important role. I have not witnessed one myself but after he said that, I sure would like to-actually, to help out! Thank you for sharing the picture & story. The comment about “Work Bees” & “Frolic” days is very common to Amish, my friend’s community did them on regular basis which included, I know of, helping an outsider cut wood for the winter-several Amish were taken by van 1.5 hrs away, to cut all the firewood an outsider family needed to get through their Maine winter. Love in action, what Christianity is about.